A 5-CD-box called Constant Change 1976 - 2016 suggests a programme of sorts. Although Howard Riley might be the most influential pianist of the British improv scene (along with Keith Tippett) his work hasn’t received the coverage of that of Evan Parker, Derek Bailey, Kenny Wheeler and John Stevens. In recent years however, the formidable Lithuanian label NoBusiness has been working to change this and has released albums of Riley’s music such as Live with Repertoire and 10.11.12 as well as extensive sets like Solo in Vilnius and The Complete Short Stories 1998 - 2010. Constant Change 1976 - 2016 is the latest offering. Howard Riley studied at the University of Wales (1961–66), where he gained a BA and MA. He then he went to Indiana University (1966–67), before he enrolled at York University (1967–70) for his PhD. He’s also taught at The Guildhall and Goldsmiths. Alongside his studies and teaching Riley’s always played jazz professionally, with Evan Parker in 1966 and then with his own trio (1967–76), with Barry Guy on bass and Alan Jackson, Jon Hiseman and Tony Oxley alternating on drums. They released three albums for three different labels, each showing a remarkable stylistic evolution, opening up standardized structures into the worlds of an unknown, free improvisational language, while still clearly rooted in jazz. The albums all share a distance from the London scene around John Stevens, what the recently deceased German musicologist Ekkehard Jost called "material researchers". Riley liked the music and played with a number of the key musicians, but his idea of freedom was different. He needed a melody or rhythmic fragment to provide a centre of gravity. The features which characterize Riley’s early trio albums are very different and show a tendency to reduction, something which also goes for his solo piano recordings. His early trios vacillate between the strong influence of Bill Evans ('Angle' and 'The Day Will Come') and freer sound explorations ('Discussions' and 'Synopsis') but he still hadn’t evolved into his more mature style. Some parts were written, there were unique, harmonic and metric schemes, and the improvisations sought to avoid clichés. There were also experiments with sound-based improvisation. In the following years he re-aligned his style, expanding his means of improvising by using the interior of the piano. His left hand gained more independence, leading to surprising contrasts in register, but not as pronounced as pianists like Cecil Taylor or Alexander von Schlippenbach. His first solo album, Singleness, "demonstrated his mastery of historical techniques, attuned, through Monk, to the language of bebop as well as to the contemporary forms of Xenakis and Penderecki", as Trevor Barre puts it in Beyond Jazz - Plink, Plonk & Scratch; The Golden Age of Free Music in London 1966 -1972. Riley sees his development as an evolutionary process, there has been constant change indeed. He works through new ideas or keeps them, to use later. "If you heard me in Huddersfield in 1960, I was playing changes. If you heard me in London in the late 60s and early 70s, you'd have heard me playing free music because that was the logical thing after playing changes and set forms … Some things you just exhaust and then, when you get older, it becomes a case of pulling it together and hopefully that's where I'm at now." In the liner notes to Facets (Impetus, 1981) Riley mentions that he's always tried to bring both sides together: the useful ideas and intellectual aspects of the European musical environment and the intensity and spontaneity which is displayed by the American jazz tradition. The resulting connections, and frictional resistance, are some of the most important features of his music. There’s a sense that for Riley there’s no evocation of the past or dialogue with tradition, just multiple voices which speak in the continuous present. 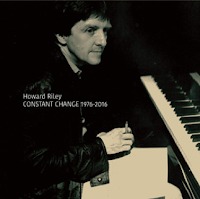 Constant Change 1976 - 2016 provides a survey of how Riley’s style has evolved over 40 years. The first disc presents him at concerts in Paris (1976) and Debrescen (1980), which reveal a very expressive pianist, with his distinctive hard touch, lines which coalesce, unravel and dissolve, and arpeggios like hailstones. Melodies are taken apart, rebuilt and then unpicked again. The opening 'Ice' reveals the influence of Evans, whereas on the following 'Boeotian' he uses violent Tayloresque clusters and darting runs. 'Zones', the key track of the Debrescen concert, is wild and edgy, like a Keith Jarrett piece gone astray, as if Riley was struggling to constrain the melody. A cold (but not unpleasant) breeze runs through this music. Fingerprints, the second disc, is a selection of recordings from London’s Porcupine Studios between 1983 and 1987, revealing a significant development. The cold breeze is still there but the music is less atonal, most of the brutal clusters have gone. As with Paris/Debrescen, Riley focuses on shorter pieces: here he plays 13 miniatures. “Fingerprints“ evokes an instrumental Robert Wyatt song, and “In Repose“ is a lyrical ballad. Only tracks like “Circling“ recall his mid-Seventies period. The last three discs present new improvisations called Mutability One, Two, and Three, concert-length improvisations of about an hour each, which were recorded over the past few years - again at Porcupine Studios, completing a circle. Mutability One (Longer Story) starts with muffled hammered notes (a hand inside the piano) with a recurrent motif, single notes reverberating against a wall of chords. No chill and greater warmth. Riley has always employed a range of dynamics, and emotional configurations, and here we find wonderful balladesque parts with romantic motifs, building tension to move matters in a more dramatic direction. In the middle of the piece he creates a small musical universe around the short phrase he’s introduced at the beginning, another characteristic of Riley’s music – hardly anything is there without a reason, and almost everything is picked up again and processed. Mutability Two (Longer Story) is the most lyrical of the new recordings, full of beautiful and surprising passages. Around the 10-minute mark a very tight passage ends with high trills, as if birds were chirping. Riley lets the music flow into a sea of mesmerizing, pearly chords shortly after which staccato notes are set-off against sentimental little melodies (without kitsch). The whole session is an explosion of ideas. Riley likes to operate at the extremes of the piano‘s spectrum and Mutability Three (Longer Story) is a good example. It starts with the left hand hammering, deep and dark, with the right hand answering with crisp, crystalline notes. It takes a few minutes before we hear chords and short arpeggios, announcing the piece proper. What’s retained from the beginning is the sharp accentuation, often buried within stride piano and boogie woogie passages, progressions of seventh chords, clusters, trills and tremolos. The dense weave of the music, with all its multicolored strands and rhythmic changes, represents a new path for Riley’s music, one that seems more personal and less opulent than his older albums, but still immersive. He works through this tapestry of metallic oscillations, cloudy bass and glittering refractions leading, to a carefully prepared climax. In recent years Riley has approached solo performance “with or without repertoire“ – the great standards, mainly Monk and Ellington. He says that it depends on the venue, audience and his mood. 'Mutability Three (Longer Story)' ends with ''Round Midnight'. The first hint of this classic can be found around the 50-minute mark; from then on Riley seems to tiptoe round the theme, briefly touching on different strands of the melody. Only at the end is it rendered in full, stark and dissonant. Monk would have loved it. Howard Riley suffers from Parkinson’s disease and in consequence, he’s had to revise his technique. It’s surprising how well this works on these last three CDs, and the music is among the finest he‘s recorded. Constant Change 1976 - 2016 will please beginners as well as longtime fans, it’s one of last year’s best releases. I’m sorry it took so long to review it. You can buy it from the label: nobusinessrecords.com (where you can listen to some excerpts) or from www.instantjazz.com.